Once again it was time for the Turkey Day Run in Downtown Charleston. It was the first race of the season with a downtown course, so I had a chance to run part of my regular downtown course without having to worry about traffic. I’ve been running with the camera lately, but this time I decided to go without it. I still took photos before and after the race, but during the action I really wanted to focus on what I was doing. This year the race started an hour later (9am) than last year and the weather wasn’t nearly as cold. Instead of cold-gear, I just showed up in my regular training clothes. The reason I look so rough in the first photo because I had run out of coffee at home. Blashpemy, I know, but somehow I let it happen. I was glad that there would be an open coffee shop downtown. There were lots of police around. It’s understandable considering the fact that there were over 4000 people registered for the race. Still, I couldn’t help but wonder if the doughnut shops were being burgled in their absence. The Knights of Columbus held the registration in their building on Calhoun Street. It was pretty much like last year. This was my second Turkey Day Run, so I knew what to do. Upon entering the building I was reminded that Piggley Wiggley is a big sponsor for the local races. I’ve often wondered who’s inside that pig costume, and who he had to piss off to get stuck with the job. 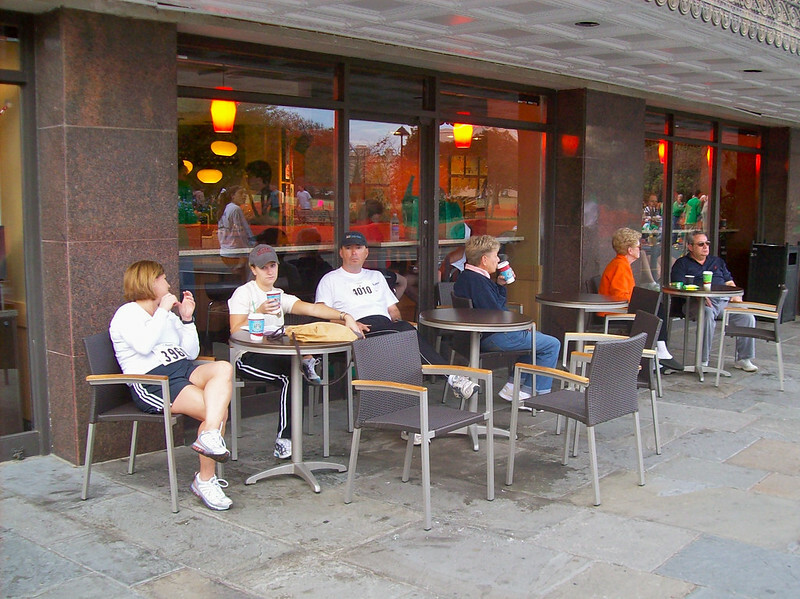 The later start and the warmer weather hurt the brand-new Starbucks a little. Nobody had to bring any warm clothes and everything started well after sunrise, so they didn’t get as many early-morning customers as they expected. Still, that have a pretty good location on the corner of King and Calhoun streets and they’re managing the place better than the café which used to be there. My goal for this race was to score a personal best. I figured that if I left the camera behind and pushed, then I could beat my previous record of 24 minutes and 16 seconds. As you can see at the top of this article, it worked. I finished with a new record of 23 minutes and 30 seconds. (I may have finished even faster if there hadn’t been so many people to dodge and pass in the beginning.) I found myself in an understandably good mood. My car was only about a block away from the Finish Line, so I went back for my camera to get some photos and video. The photos came out okay, but after looking at the last few videos I find that I’m even more disappointed in my new camera. I suppose you get what you pay for, but I really didn’t want to spend three hundred dollars on a camera which could get rained upon or dropped. (It certainly gets a good dose of sweat on the longer races.) As much as it pains me to say it, I’m just going to have to save up for a better camera. There was one other weird bit which you can see in the video above. As with many other small races where electronic chips aren’t used, the men and women were separated at the end. Men to the left, women to the right. Once you run down the chute, you give somebody a hand-written tag from your race number, and that’s how they keep track of who finished in front of who. For some stupid reason, these guys kept moving the lines. You can see them do it in the video. When I was finishing, one of those idiots actually stepped in front of me and blocked my path. He then lifted the rope for me and allowed me to cross the Finish Line. He cost me two seconds, so I subtracted them to get the final time I listed above. After I crossed, they moved the ropes just as you can see in the video. There is absolutely no reason for this. All you have to do is set up the ropes once and tell people which way to run. It’s a simple task and I’ve seen it done in plenty of races. Even without chips, people are still looking at the clock. 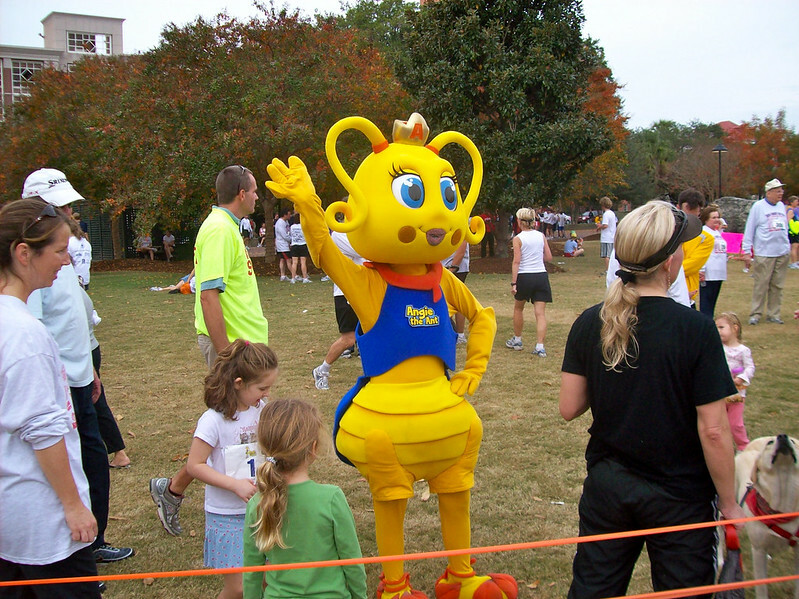 When people are crossing that Finish Line, the volunteers should step back. I really don’t understand why there are beer trucks at a race like this. I guess they’re for the people who just walked. Besides those, I saw the usual compliment of fruit and water tables. Things started to get pretty packed after the thirty-minute mark was reached. When the walkers arrived things were pretty packed. My hopes of finding any of the people I met before the race were dashed, but I did manage to bump into a few other regulars. Below you’ll see another mascot besides the Piggley Wiggley Pig. She’s called Angie the Ant, and she has a pretty cool website. I’m not really interested in children’s books, but do like cartoons, and anything involving Flash will get my attention. After wading through the crowd a bit, I finally decided to head home. I celebrated the day’s victory by cooking myself a big meal and tossing Batman Begins into the DVD player. All things considered, it was a pretty good day.